style="text-align:center;"> Please note that this topic has not had any new posts for the last 2947 days. I have a Royal bank of scotland credit card which i have missed payments on this has now been passed to Moorcroft for collection. The credit card account has been open for about 10-15 years now maybe more. I ran into difficulty paying it etc etc etc and lost track of the account and royal bank of scotland have now passed it on to Moorcroft. I was advised to send a CCA Request to moorcroft to which i did and they have replied i have uploaded the letter they sent me. Can somebody please advise me what to do next? What should I reply to that letter? Your reply is simply Put the Account in Dispute send the site library template letter. thanks.. is the template letter in the Debt Collector library? JW Yes,titled "Failure to provide a copy of the agreement within the prescribed timescale",,the 14 days have expired since you made the CCA request,the fact they cannot produce an agreement and they have put this in writing,is their problem. 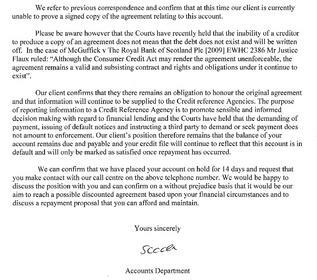 Some of the threats in the Moorcroft letter will contravene the failure to supply an agreement,such as you must continue to pay and the debt will be registered with a Credit Agency,Remind them any action of this nature will be viewed as a complete OFT guideline avoidance and will drawn to the attention of the OFT should they see fit to ignore the guidelines. I am of the school debts should be paid but on your terms and if they are unable to comply with your legal requests,then it should be very much on your terms. I'd have a look at re-claiming charges also, there must be a few. Jon..Maroondevo makes a very good point,have you got all of your statements this will show charges that can be reclaimed? JW Hi.read through your attached files,under the current legislation if this ended up in court(not suggesting it will) I do not think you would win,OK no agreement with signature,however there is sufficient documentation to confirm an account exists and payments have been made,Sorry. There must be charges that you can claim back plus any PPI involved? If you do not have all of the statements you will need to send a SAR,if you have all the statements as Maroondev said in an earlier thread No8 add the charges up and reclaim. I understand that this debt has to be paid back, but surely they cannot enforce it and i can make them a offer? JW Hi,enforcement of CCA has been the subject of many threads,that have got heated at times. Although in your case they cannot produce an agreement with a signature,they can prove you have used the account and made payments,and in the vast majority of cases that end up in court the fact that the OC cannot produce a signed agreement is being ignored(the guidelines state no signed agreement no case)or words to that effect. The OCs and DCAs are aware of this and are being really difficult.If you are going to make an offer of payments,you need only pay what you can honestly afford,if you are considering a F&F offer this is a different situation,you need to be really careful on how you word the offer. I am going to write to RBS (as opposed to phone) with an offer of monthly repayments. Is there a form of words I should use? Any tips etc. ?